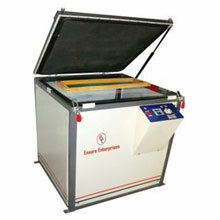 We have Screen Exposing Machine in different sizes for various applications. These units have performed satisfactorily by providing perfect results every single time. vacuum pump, Imported vacuum blanket, special electronic circuits, reliable damper system, digital pulse counter and many such features makes it most preferred machine. Available of KW. 1KW, 2KW, 3KW, Available with UV tube lights in frame ranging from 15" x 20" to 30" x 40".